Welding Technology provides students with the opportunity to acquire skills, knowledge, and experiences required to pass a standard welding qualifications test and pursue a career in an expanding and rewarding technical field. 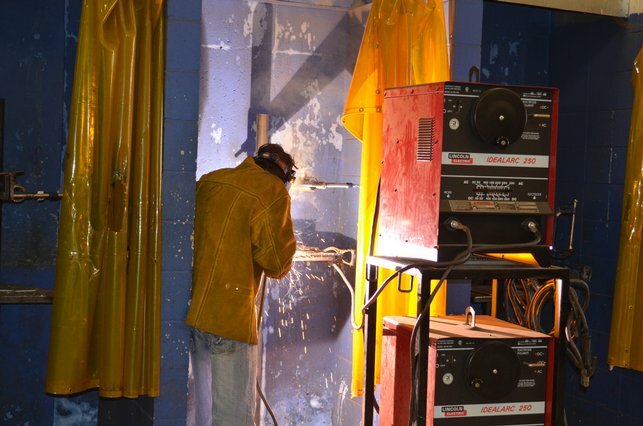 Classroom instruction and laboratory experiences allow students to gain scientific knowledge regarding welding ferrous and nonferrous metals using the processes of Shielded Metal Arc Welding (SMAW), Gas Metal Arch Welding (GMAW), Flux core Arc Welding (FCAW), and Gas Tungsten Arc Welding (GTAW). Specialized classes provide students with skills in oxy-fuel cutting, plasma arch cutting, air carbon arc cutting, blue-print reading, weld symbols, and welding inspection and testing. Progression to the next level of instruction will be based on the successful completion of the prior course. NCCER credentialing will be available upon successful completions of the courses offered in this program.